My thoughts drifted to that night after service, the hunger in Jacob's touch and the way his lips had claimed my body. Just the memories made me tingle. Lying back on the bed, I held my side and sighed. If only he weren’t so worried about my ribs. Courtesy of the truck ride yesterday, the injury was more aggravated then it had been. I’d tried hiding it. Shaking my head, I wondered if it was possible to hide anything from him. According to Elizabeth it wasn’t allowed. The way I saw it, I wasn’t lying. I was withholding information for the benefit of both of us. By the way his breathing became labored and his body hardened that night at the clinic, I wasn’t the only one who wanted to make love. 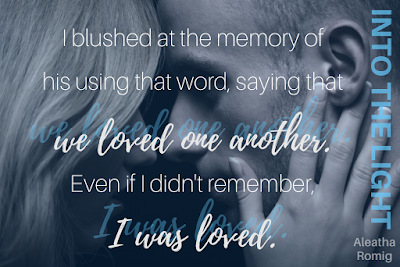 It seemed as if it didn’t matter if I told Jacob what I was thinking or not; he knew. Somehow he always seemed to know, sometimes even before I did. Maybe it was because we’d been together so long. If only I could remember how long. The sound of the rising garage door pulled me from my carnal thoughts, and I covered my cheeks. With a giggle I hoped they weren’t as flushed as they felt. If they were, he would know what I’d been thinking . . . I shook my head. I didn’t want that conversation. Exhaling, I willed the pink away. When I heard the garage door lowering, I stood and made my way toward the stairs. Wearing the boot on my right foot made walking with my cast much easier. As I approached the landing, I took a deep breath and visualized the stairs. Since I’d counted them multiple times, I knew there were fifteen steps. I might not have my sight, but I was trying to be as self-sufficient as possible. I made it only to the second step from the top when I heard his voice. “I’m coming down,” I called, taking one step at a time, cautious not to go too fast. Even before I reached the bottom step, I knew he was there. When we went to service, I’d realized why I associated him with the scent of leather; it was his coat. When he wasn’t wearing it, just the right amount of aroma lingered around him. When he wore it, as now, the leather scent was overpowering. That, plus the sound of his boots walking and stopping on the wood floor, prompted me to stop on the fourteenth step. If I went one more, I was afraid I’d run into him. “Sara.” His voice came from very close. What the hell is his problem? My body sagged and my knees weakened. The bubble within me grew and popped, filling my nervous system with dread. “No. I don’t need a reminder. I’ll remember from now on. Please give me another chance.” If it hadn’t been for his iron grip on my forearm, I might have fallen to the step where I stood. If I had, I wasn’t sure if it would have been because of the sudden dizziness his tone induced, the bout of trembling, or that it would’ve enabled me to beg. It wasn’t something I was proud of considering, but to avoid his belt, at that moment, I was willing. Inhaling more pleas, I nodded. When he released my arm, I stepped down and down again. Around the steps, past the closet, I found the door between the living quarters and the garage. I swallowed the vile bile bubbling from my stomach. In that moment I couldn’t for the life of me fathom that merely minutes ago I had been having pleasant thoughts about this man. I also couldn’t imagine kneeling. He reached for my chin and lowered it. 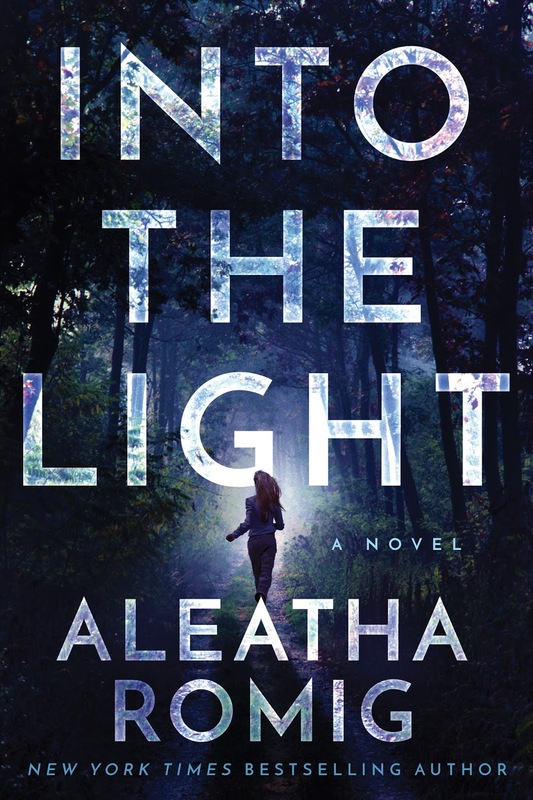 This book is part thriller, part romance, and all enthralling. It's the story of Stella, who is searching for her missing coworker, and the story of Sara. Sara wakes up in a hospital with no memory. Her eyes are covered with bandages and she has a cast on her leg. She wakes up to a strange man, Jacob, telling her he's her husband. The two belong to a cult called The Light. In this religious cult, the man is in charge. The women must obey their husbands and if not they are corporally punished. Sara struggles to understand how she became a part of this world. But in doing so, she gradually falls in love with Jacob. She might not remember him, but she learns to trust, obey, and eventually love him. Jacob seems to be a mess of contradictions. He insists upon obedience, but he's gentle and helps Sara adjust to her life. The reasons why come out at the end of this book. Normally I don't like when books flash back and forth between characters or time periods, but Aleatha Romig does it so well that there is no confusion. The story blends and makes you want to know why there's back and forth. Once again, that all comes out in the thrilling ending. There is a cliffhanger and I can not wait until the next book comes out. 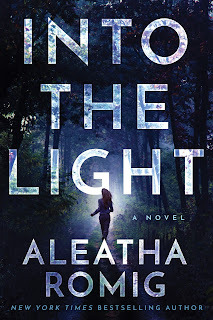 I loved Into the Light and give it FIVE STARS!